Carbon Allotrope: The ability of the element Carbon to bond to four other atoms covalently means that pure Carbon can found in a variety of structural forms. Each of these pure forms with different chemical structure is known as an allotrope of Carbon. The two best known forms of pure Carbon are Diamond and Graphite. In Diamond, all four electrons in the outer shell of the Carbon atom are used in bonds with other Carbon atoms. This is easily seen in a 2-Dimensional model as shown to the right. 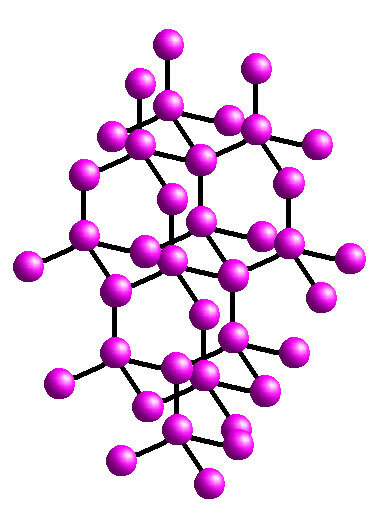 However this is not an accurate depiction of the structure of Diamond. Following the rules of vsepr, we need to space out the bonds in all three dimensions. If we do this we can see that each single Carbon atom will look more like the second diagram. When we connect these carbon atoms into an ongoing three dimensional lattice, the picture becomes somewhat less clear. The lattice shown below extends onward in all three dimensions until the edge of the diamond crystal is reached. The bonds are very tightly held together, giving Diamond its great strength. Graphite is the last stage of compression and fossilization of plant material. The plant matter was originally sugar molecules, which on the whole are hexagonal carbon rings with Hydrogen and other atoms bonded to the carbon atoms. 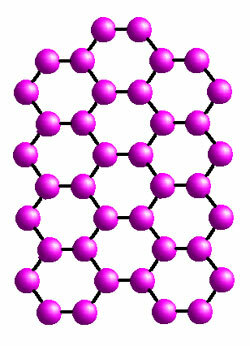 All that remains of that in Graphite is the Carbon atoms, which are still bonded in hexagonal rings. The rings are bonded to each other in flat sheets that are stacked one on top of another. This explains the properties of Graphite that we are familiar with. As with metals that also possess the free electrons, Graphite is shiny, conducts electricity and is slippery to the touch. Unlike metals the layers in Graphite are easily separated. Other forms of pure Carbon are variants based on the structure of Graphite. Carbon nanotubes are effectively Graphite sheets rolled into tubes. 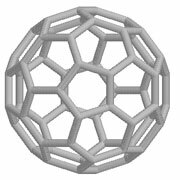 Buckyballs are 60 carbon atoms bonded together in a similar fashion to Graphite but in a sphere. In this case the Carbon atoms are bonded to each other not in perfect hexagons but in a combination of hexagons and pentagons in the same pattern as an old fashioned soccer ball. Theoretically there is no end to the number of possible structures that can be made from pure Carbon.